Perhaps the most infamous of Germany’s bombers was the single-engine Junkers Ju87, better known as the Stuka. Designed in the mid-1930s, the Stuka was a dive bomber, which deployed its 1,100-pound bomb load not from level flight but from low altitude, near the end of a sharp 80-degree dive. This ensured surgical accuracy of the strike. By 1942, it was even fitted with a single 4000-pound bomb, which was used against heavy tanks. After striking its target with bombs, the Stuka often circled around to strafe survivors with its three 7.9-mm machine guns. The aircraft was also fitted with sirens, so-called Jericho trumpets, which produced a truly terrifying scream during the high-speed dive. Thus, the weapon produced as much panic and terror as physical destruction. The Junkers Ju 87 was an exceptionally pleasant aircraft to fly, combining light, well harmonised controls with good all-round visibility and excellent manoeuvrability. It was ugly and cumbersome looking, and laden with character and charisma. The aircraft had amassed an enviable combat record in Spain and Poland, operating as a type of 'Flying Artillery'. But even in Poland, the Ju 87's flaws were plain to see. For while the Ju 87 was an exceptionally accurate way of placing bombs on target (with twice the accuracy of its closest rivals) the aircraft was also frighteningly vulnerable to any enemy defences, and especially to enemy fighters. The Luftwaffe gained an early enthusiasm for dive-bombing even before its existence was officially acknowledged. Udet bought a pair of Curtiss BFC-2 Hawk IIs for dive bombing trials in 1933, and personally evaluated the SB2C Helldiver, while dive bombing was already one of the primary roles of the Junkers K-47. The Henschel Hs 123 biplane was ordered as an interim dive bomber, and a requirement for a definitive dive bomber aeroplane was issued in January 1935. This led directly to the design of the Ju 87, whose prototype made its maiden flight in early 1935. The Ju 87 looked anachronistic even before it flew; with its fixed, 'trousered' undercarriage and angular appearance. The competing Heinkel He 118 was faster, more manoeuvrable and more modern, but the sole prototype was destroyed during competitive trials, leaving the Ju 87 as the overall winner of the competition. Ju 87s fought with conspicuous success in Spain, but the type was felt to be almost obsolescent as World War II broke out. Even the arrival of the Ju 87B, with its more powerful 1200 hp Jumo 211Da engine and minor aerodynamic refinements was felt to be a step which would delay the type's inevitable retirement very little. But the almost complete lack of air opposition in Poland and the Low Countries (and the Stuka's corresponding success) led some to re-evaluate the aircraft's capabilities. Some senior officers began to think that perhaps it was still a viable weapon. Proper operational analysis would have shown that when the Ju 87 had come up against enemy air opposition it had generally performed very poorly indeed. The air operations over Dunkirk would have reinforced this point - had people not been too busy celebrating the historic overall victory over France. It was too easy to see only the Ju 87's strengths - its ability to spread fear and panic among enemy soldiers and refugees, its pinpoint accuracy, and its ability to respond rapidly to demands for close air support. But Dunkirk showed that even when heavily escorted, the Ju 87 was hopelessly vulnerable, being too slow, too cumbersome, with inadequate armour and inadequate defensive armament. 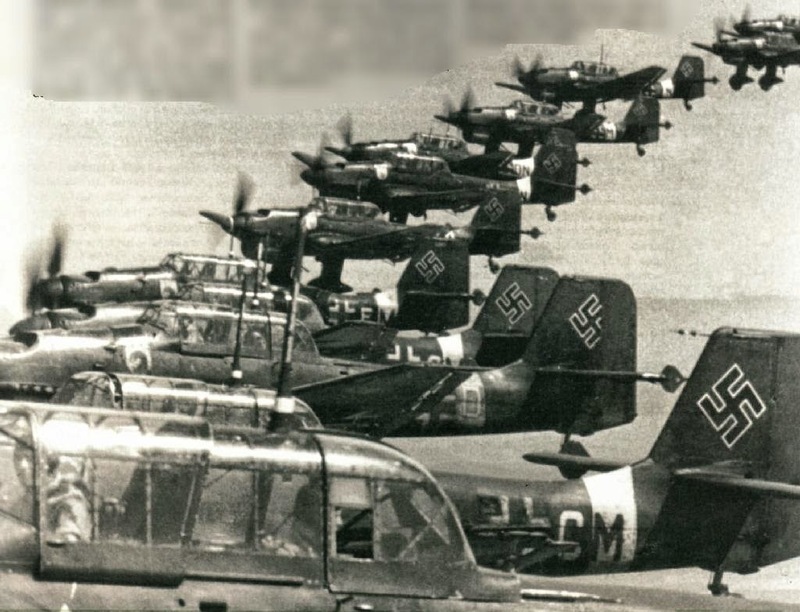 The aircraft's lack of range had been partially addressed, however - relatively large numbers of improved Ju 87B-2s and longer-range Ju 87Rs were available among the 316 Stukas gathered for the Battle. The Stuka played its part in the Kanalkampf, attacking Channel shipping and some coastal targets. Most of the Stuka raids in early July were quick 'hit-and-run' raids, often heavily escorted. Once the Ju 87s turned their attentions to Fighter Command's airfields, the RAF had even more time to react, and the Stuka's losses increased steadily. More often than not, formations of Ju 87s would lose up to half their number, or would be forced to turn back without attacking their targets. On 18 August the Luftwaffe lost 17 Stukas, and the type was withdrawn from active operations after a last dive-bombing attack on 30 August. The only units retained were IVStG 1, IVStG 2, and IV (St)/LG 1 for possible night operations, and VStG 3 for anti-shipping use. But the Stuka's part in the Battle was over, apart from sporadic anti-convoy missions flown in early November.